The Secret Diary of Steve Jobs : What happens when you build a company without owning any IP? What happens when you build a company without owning any IP? 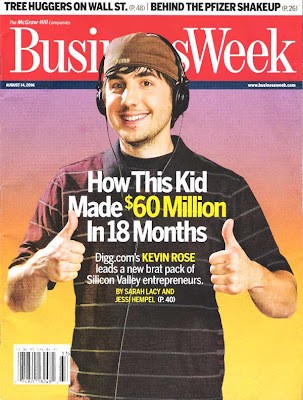 Well, if you’re Kevin Rose of Digg, first you get on the cover of BusinessWeek, then you end up having to do whatever your frigtarded users tell you to do, even if they’re telling you to break the law. You even have to grovel, as Kevin Rose does here. No doubt you know about this but in a nutshell some idiots posted some anti-encryption codes (they’ve put them on this site, too, in comment strings) and Digg took them down after getting legal threats. But now Digg has put them back because its users demanded it. And because, um, Digg doesn’t really have anything other than these crazy users and they live in constant fear that the party will move on to some other place. I’ve said it before and I’ll say it again. Digg is not a tech company. Neither are most of these Web 2.0 shops. Why people invest in them, I’ll never know. I’m sure that’s just what Digg’s investors wanted to hear. Right? Poor bastards. For the record they are Greylock, Omidyar and some angels. No doubt they’re happy to bankroll this experiment in free speech and kowtowing to crazy mobs. Best of all is that the Diggsters had a chance to sell out last year but chose to hang in for higher valuation. D’oh! Digg on, nitwits.